Now the best classroom sharpener in the world is yellow. 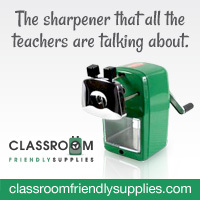 This quiet sharpener will sooth your ears as students sharpen their pencils. Not only is it quiet, but it actually works! You can put any pencil in, and voila--a sharp pencil. I have given this sharpener to every single one of my children's teachers! They love, love it! 1. Can't use this sharpener on colored pencils. 2. Sometimes I find the pencils are too sharp! The positives outweigh the negatives: quiet, easy to use, efficient, loved by all. As I mentioned, I have bought more and will continue to buy more! So head over to Classroom Friendly Supplies so you to can enjoy the quiet while pencils are being sharpened!